The armoured cruiser Admiral Scheer in the mid-1930's. 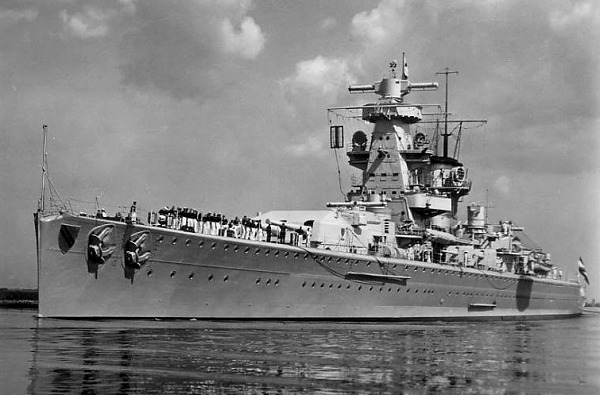 The Admiral Scheer was the second Panzerschiff of the Deutschland class. During the Spanish Civil War (1936-1939), the Scheer conducted several non-intervention patrols off the coast of Spain. Particularly noteworthy was the bombing of the Spanish Republican positions off Almeria, in retaliation for the previous attack on her sister ship Deutschland by a Loyalist Spanish plane. The Scheer took no part in operations during the first year of the European war due to reconstruction works at the shipyard in Wilhelmshaven. Once finished, she ran a successful commerce raiding campaign in the Atlantic and Indian Oceans. The Scheer spent 161 days at sea and covered over 46,000 nautical miles, sinking or capturing 16 ships totaling 99,059 GRT in addition to the auxiliary cruiser Jervis Bay. In 1942, the ship was sent to Norway to become part of the so-called "fleet in being" and saw little action. Back in Germany, the Scheer was used for training purposes in the Baltic, and later provided ground support against the advancing Soviet troops. In March 1945, the ship was transferred to Kiel where it was bombed on 9 April. 25 June 1931: Lay down on Slipway 1 at Marinewerft, Wilhelmshaven. Construction number 123. 01 April 1933: Launched. Christened by Marianne Besserer, daughter of Admiral Reinhard Scheer after whom the ship is named. Admiral Scheer (1863-1926) commanded the German fleet at the Battle of Jutland (known in Germany as the battle of the Skagerrak) during World War I. 12 November 1934: Commissioned under Captain Wilhelm Marschall. 14 December 1934: Adolf Hitler visits the ship together with the Minister of Defence Generaloberst Werner von Blomberg, and the Commander-in-Chief of the Navy Admiral Erich Raeder. 20 December 1934: Departs Wilhelmshaven. January-March 1935: Conducts sea trials in the Baltic Sea. 11-16 June 1935: At Kiel on the occasion of the Naval Week. 30 August - 01 September 1935: Visit to Danzig. 19 October - 09 November 1935: Training cruise in the Atlantic with her sister ship Deutschland. Anchored in Funchal, Madeira on 25-28 October. Arrives in Wilhelmshaven on the 9th, via the English Channel. 29 May 1936: Participates in the fleet parade for the inauguration of the naval memorial at Laboe, near Kiel. 06-19 June 1936: Together with the Deutschland cruise through the English Channel, Irish Sea, Orkney-Shetland Channel, Skagen, returning to Kiel. 23-29 June 1936: Visits Stockholm. King Gustav V of Sweden comes on board. 02 July 1936: Arrives in Kiel. 24 July 1936: Departs Wilhelmshaven together with the Deutschland. 27 July - 28 August 1936: Operations in Spanish waters off the Republican coast, including the evacuation German citizens living in Spain. Itinerary: Wilhelmshaven, English Channel, Strait of Gibraltar, Malaga (27 Jul. ), Barcelona (28-30 Jul. ), Valencia (31 Jul. ), Alicante (31 Jul. ), Cartagena (1 Aug.), Almeria (1-3 Aug.), Tarragona (4 Aug.), Barcelona (4-5 Aug.), Valencia (5-6 Aug.), Alicante (6-18 Aug.), Malaga (22-24 Aug.), Gibraltar (25-26 Aug.). 30 August 1936: Passes through the Kiel Canal. 31 August 1936: Arrives in Kiel. 02 October - 03 December 1936: Operations in Spanish waters. 15 March - 07 April 1937: Operations in Spanish waters. 09 May 1937: Departs again for Spain. 31 May 1937: At 0729 hours, opens fire on Spanish Republican positions off Almeria, in retaliation for the bombing of the Deutschland two days earlier. Expends 91 x 28 cm, 100 x 15 cm, and 48 x 8.8 cm projectiles. 26 June - 01 July 1937: Returns to Wilhelmshaven. 30 July - 11 October 1937: Operations in Spanish waters. End of October 1937: Drydocked in Wilhelmshaven. 12 February - 14 March 1938: Operations in Spanish waters. 19 March - 29 June 1938: Operations in Spanish waters. 22 August 1938: In Kiel for the launching of the heavy cruiser Prinz Eugen. 31 October 1938: Captain Hans-Heinrich Wurmbach assumes command of the ship in Wilhelmshaven. 14 February 1939: In Hamburg for the launching of the battleship Bismarck. 23 March 1939: Present during the annexation of Memel Territory. 01 April 1939: At Wilhelmshaven during the launching of the battleship Tirpitz. 18 April - 03 May 1939: Atlantic cruise. Visit to Bilbao, Spain on 22-28 April. Returning to Kiel. 04 September 1939: While anchored off Schillig roads during a British air raid by Bristol Blenheim aircraft, she is hit by three bombs that fortunately fail to explode. Shoots down one aircraft. 31 October 1939: Captain Theodor Krancke assumes command of the ship. 01 February - 30 July 1940: Reconstruction in Wilhelmshaven. The mainmast is replaced by a tubular mast similar to that of the Deutschland/Lützow. Added a new funnel cap and Atlantic bow. Ship reclassified as heavy cruiser. August - September 1940: See trials in the Baltic based in Gotenhafen. 23 October 1940: Departs Gotenhafen and heads west. 26-27 October 1940: Passes through the Kiel Canal. 27 October 1940: Departs Brunsbüttel for the Atlantic in order to carry out operations against merchant shipping. 31 October 1940: Transits the Denmark Strait. 05 November 1940: Sinks the British steamer Mopan (5,389 GRT) at 52º 48' North, 32º 15' West. A few hours later she finds Convoy HX84 of 37 ships and escorted only by the 14,164-ton auxiliary cruiser Jervis Bay (Captain Edward Fegen) that is sunk after a brief engagement of 20 minutes. Position 52º 45' North, 32º 13' West. After that sinks the Maidan (7,908 GRT), Trewellard (5,201 GRT), Kenbane Head (5,225 GRT), Beaverford (10,042 GRT), Fresno City (4,955 GRT), and damages another three. 12 November 1940: Refuels from tanker Eurofeld. 14 November 1940: Rendezvous with supply ship Nordmark. 24 November 1940: Sinks the British steamer Port Horbart (7,448 GRT). Position 22º 44' North, 58º 21' West. 01 December 1940: Sinks the British steamer Tribesman (6,242 GRT). Approx. position at about 15º North, 35º West. 14 December 1940: Rendezvous with supply ship Nordmark. 18 December 1940: Captures the refrigerator ship Duquesa (8,651 GRT) carrying 3,539 tons of frozen meat and 720 tons of eggs. Position 00º 57' North, 22º 42' West. 26 December 1940: Rendezvous with auxiliary cruiser Thor, supply ship Nordmark, and tanker Eurofeld. 17 January 1941: Captures the Norwegian tanker Sandefjord (8.038 GRT). 20 January 1941: Sinks the Dutch steamer Barneveld (5.597 GRT) and the British freighter Stanpark (5.103 GRT). 03 February 1941: Passes south of Cape of Good Hope into the Indian Ocean. 14-17 February 1941: Rendezvous with auxiliary cruiser Atlantis, the German freighter Tannenfels, and two prizes, the British freighter Speybank (5.144 GRT) and the Norwegian tanker Ketty Brövig (7.031 GRT). Approx. position 54º East, 13º South. Admiral Scheer refuels from the Ketty Brövig on the 17th. 20 February 1941: Captures the British tanker British Advocate (6,994 GRT) to the east of Zanzibar, and later sinks the Greek freighter Gregorios (2.546 GRT). Approx. position 45º East, 10º South. 21 February 1941: Sinks the Canadian freighter Canadian Cruiser (7,178 GRT). Position 47º 18' East, 06º 36' South. 22 February 1941: Sinks the Dutch freighter Rantau-Pandjang (2,542 GRT). Position 51º 35' East, 08º 30' South. 02 March 1941: Passes south of Cape of Good Hope back into the Atlantic Ocean. 27 March 1941: Transits the Denmark Strait on her way back to Germany. 30 March 1941: Arrives in Bergen. 01 April 1941: Arrives in Kiel escorted by destroyers Z23 and Z24. The crew is personally welcomed by Grand Admiral Raeder. 15 April - 23 June 1941: General machinery overhaul in Kiel. 12 June 1941: Captain Wilhelm Meendsen-Bohlken takes over command of the ship in Kiel. July-August 1941: Training in the Baltic sea. 04-08 September 1941: Departs the Bay of Mecklenburg for Oslo. Returns to Swinemünde on the 8th. 23-26 September 1941: Remains off Aaland Island with the "Baltic Fleet" (Vizeadmiral Otto Ciliax) comprised of the battleship Tirpitz (flagship), the light cruisers Köln, Nürnberg, Emden, Leipzig, destroyers Z25, Z26, Z27, and torpedo boats T2, T5, T8, T11, to prevent any sortie of the Soviet fleet based in Leningrad. October-November 1941: At Hamburg. Eight weeks at Blohm & Voss machinery overhaul. 21 February 1942: Operation Sportpalast. The Admiral Scheer departs Brunsbüttel for Norway together with the heavy cruiser Prinz Eugen as flagship with the C-in-C of Battleships (Vizeadmiral Otto Ciliax) on board, and destroyers Richard Beitzen, Paul Jacobi, Hermann Schoemann, Friedrich Ihn, and Z25. 22 February 1942: At about 1300 hours, Admiral Scheer and Prinz Eugen anchor in the Grimstadfjord near Bergen. The ships weigh anchor at 2040 in the evening. 23 February 1942: Scheer puts into Trondheim at 1245 hours and anchors in the Lofjord. 09 May 1942: Operation Birke. Transferred north to Narvik with supply ship Dithmarschen and torpedo boats T5 and T7. 02 July 1942: Operation Rösselsprung. At midnight, the heavy cruisers Lützow (flagship) and Admiral Scheer leave Narvik under the command of Vizeadmiral Oskar Kummetz, together with destroyers Z24, Z27, Z28, Z29, and Z30. They are to join in Altafjord with the battle group from Trondheim under the command of Admiral Otto Schniewind and comprised of the battleship Tirpitz, the heavy cruiser Admiral Hipper, the destroyers Friedrich Ihn, Hans Lody, Karl Galster, Theodor Riedel, and the torpedo boats T7 and T15. Once in Altafjord their mission is to attack the convoy PQ17 with 36 merchantmen. During their voyage to Altafjord the destroyers Hans Lody, Karl Galster, and Theodor Riedel of the Tirpitz group run on to rocks, eliminating them from the operation. The Lützow also runs on to rocks and returns to Narvik. 16-30 August 1942: Operation Wunderland. Departs Bogen Bay initially escorted by destroyers Friedrich Eckoldt, Erich Steinbrinck and Richard Beitzen to operate against enemy convoy routes in the Kara Sea. On 24 August, sinks the icebreaker A. Sibiryakov (1,383 tons) off Vilkitsky Strait. The Germans pick up 22 survivors including Captain Kacharava. During the night of 25-26 August, opens fire against the Soviet installations at Dickson Harbour. Arrives in Narvik at 1800 hours on 30 August. 10-11 September 1942: Admiral Scheer, Admiral Hipper, and Köln, together with destroyers Z23, Z27, Z29, Z30, and Richard Beitzen, are transferred from Bogen Bay to Kåfjord/Altafjord. 20 October 1942: Departs Kåfjord/Altafjord southbound for Trondheim. 24 October 1942: Arrives in Trondheim. 06-11 November 1942: Departs Trondheim escorted by destroyers Z23, Z28, Z29, and returns to Germany. 12 November 1942: Arrives in Swinemünde. December 1942: Transferred to Wilhelmshaven for overhaul and repairs. 01 February 1943: Captain Richard Rothe-Roth assumes command of the ship in Wilhelmshaven. 23 March 1943: During the course of an air raid over Wilhelmshaven, the Scheer is hit by a bomb that fails to detonate causing only minor damage. 27 March 1943: At 1530 hours, departs Wilhelmshaven for Swinemünde. 03 June 1944: Transferred to Gotenhafen. 06-10 June 1944: Drydocked in Gotenhafen. 21 September 1944: Arrives in Swinemünde from Bornholm with 150 Hitler Youth boys aboard. 07-14 October 1944: At Swinemünde. 15 October 1944: At noon departs Swinemünde eastbound for Gotenhafen. 25 October - 19 November 1944: At Gotenhafen roads. 21 November 1944: Operation Hammer. Under the overall command of Vizeadmiral August Thiele, the Scheer departs Gotenhafen with torpedo boats T3 and T12 for shore bombarment operations against Soviet positions in the Sworbe peninsula on the island of Ösel. 22-24 November 1944: Engages Soviet forces off Sworbe. 25 November 1944: Returns to Gotenhafen. 26 November 1944 - 15 December 1944: At Gotenhafen. 16 December 1944: Transferred to Pillau. 17 December 1944 - 03 February 1945: At Pillau. 17 March 1945: Departs Swinemünde for Kiel. 09 April 1945: Bombed in Kiel, ship capsizes. July 1946: The wreck of the Admiral Scheer is broken up. 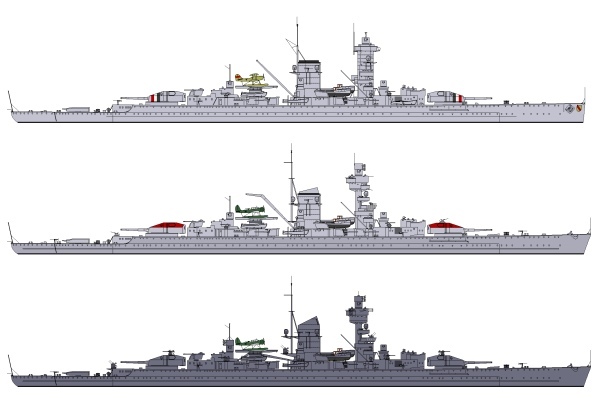 The Admiral Scheer as she looked during the Spanish Civil War (top), in 1941 (center), and in 1942 (botton). 12 November 1934 - 21 September 1936: Kapitän zur See Wilhelm Marschall. 22 September 1936 - 30 October 1938: Kapitän zur See Otto Ciliax. 31 October 1938 - 24 October 1939: Kapitän zur See Hans-Heinrich Wurmbach. 31 October 1939 - 03 June 1941: Kapitän zur See Theodor Krancke. 12 June 1941 - 28 November 1942: Kapitän zur See Wilhelm Meendsen-Bohlken. 29 November 1942 - 31 January 1943: Fregattenkapitän Ernst Gruber. 01 February 1943 - 04 April 1944: Kapitän zur See Richard Rothe-Roth. 05 April 1944 - 09 April 1945: Kapitän zur See Ernst-Ludwig Thienemann. Displacement: standard 12,100 mt, full load 15,180 mt. Dimensions: Waterline length 181.7 m, overall length 186 m, beam 21.3 m, maximum draft 7.2 m, depth 12.2 m.
Armour: main belt 80 mm (14º inclined), turrets 75-150 mm, barbettes: 125 mm, armour deck 20-40 mm, conning tower 150 mm, torpedo bulkhead 40 mm. • 6 x 28cm SK C/28 guns in two triple turrets. • 8 x 15cm SK C/28 guns in single turrets. • 6 x 8.8cm SK C/31 guns in three double mounts (later replaced with 6 x 10.5cm SK C/33 guns). • 8 x 3.7cm SK C/30 guns in four double mounts. • 10 x 2cm MG C/30 guns in single mounts. • 4 x 10.5-m base rangefinders. • In 1940: 1 x FuMO 22. • In 1942: 2 x FuMO 26. Seaplanes: 1 x Heinkel He-60 (replaced in 1939 with 1 x Arado ar 196). Propulsion plant: 8 x MAN diesel engines, two shafts, 54,000 hp. One rudder. Speed: 26 knots (designed), 28.3 knots (at 52,050 hp on trials). Endurance: 17,560 nm at 15 knots, 6,960 nm at 27 knots. Crew: 1,350 (including prize crew).